The best appointments start with great consultations, especially when your client is requesting a dramatic transformation. So, when one of Sara Pestella’s (@saramay_level10) regulars wanted to chop her long and lived-in balayage, here’s how she approached the color and cutting processes. 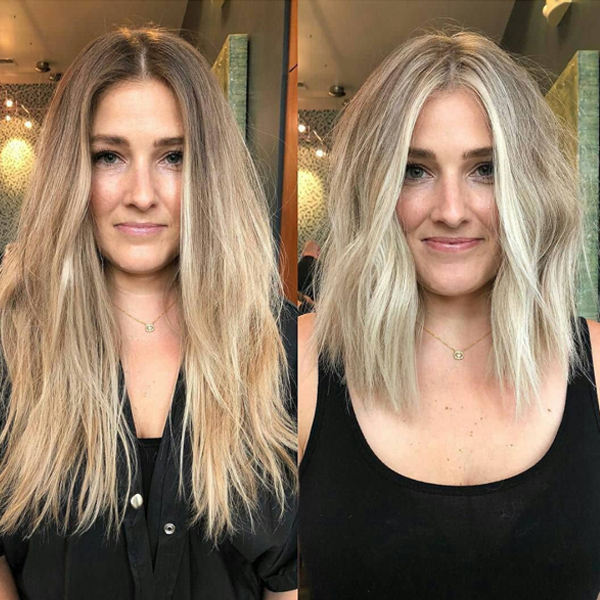 Read Sara’s consultation below, then check out the formulas and steps she used to achieve this icy lob makeover! After the consultation, Sara and Candace decided to a partial foil for two reasons. One, her haircut would have a slight undercut and it’s at a length that would keep any dark hair from creeping out from underneath. And two, Candace is on a budget. Knowing all of this, Sara determined the most appropriate process and got to work! Price: $350 for a partial foil, shadow tone, Olaplex, cut and an extra bowl of color. 2. For Sara, placement is key and depends on how the hair organically moves. “Light is only as light as the dark it sits next to,” she said. “Sometimes blonde gets lost if you don’t leave depth or don’t give more light in certain areas.” Sara decided to begin foiling on the sides with Formula A, placing four foils back-to-back, then taking the hair between foils, teasing it and putting the ends only in foil, followed by four to six more foils without teasing the ends. 3. Repeat on the other side, working your way up to Formula B as needed. 4. On the top Mohawk section, Sara did four to six back-to-back foils, then teased the ends and put them in a foil. “I never do the same amount of back-to-back foils on everyone because some clients need more and those with fine hair need less, or she’ll look like 2000s Christina Aguilera ‘Stripped’ CD cover.” (LOL.) Sara added, “The closer the foils, the more solid the blonde appears. Leave a tiny bit of space and you will have a tiny bit of diffusion. 5. After processing, rinse and tone with Formula C.
7. To style, Sarah used a 1-inch R Session Pro Tools flat iron to slightly bend the hair on the top section. “With this cut, it isn’t about perfection—it’s a free-flowing haircut and the less you do, the better it looks in my opinion.” Sara finished with Aveda air control™ Light Hold Hairspray for light hold and texture, then added Aveda shampure™ Dry Shampoo to the ends for some added grit.